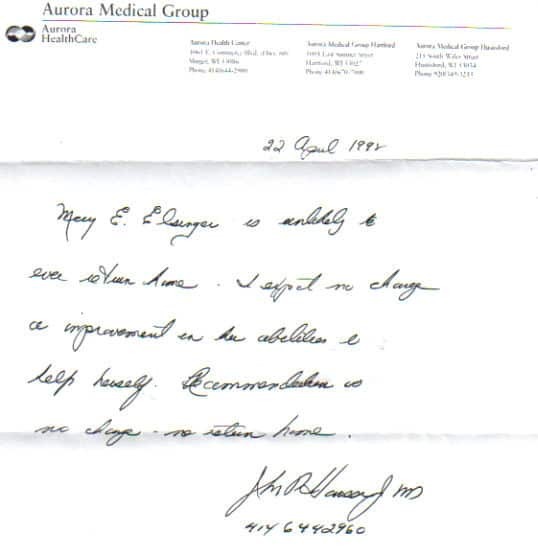 1998 – Medical Doctor states Mary is unlikely to ever return Home. When listening to the Hartford radio station some years ago. There was an announcement of a new chiropractor opening a business in Slinger; Riegleman Chiropractic Center. At the time I had poor circulation in my legs. Dr. John Riegleman worked out a blood clot, releasing the pressure in the leg. Dr. John started a practice in Mayville and was no longer available at Slinger. For convenience sake I kept going to Slinger where Dr. Paul did adjustments for me. This relieved much pain in my back. I then developed cancer of the breast. Surgery was done in July. During recovery, Dr. Paul came to my home to treat me, since I couldn’t drive at the time. I was able to go back to work after a short recovery. In August I was back to work. I feel this was possible because of Dr. Paul’s treatments and support. The following year I developed aches in my back and a lump developed between vertebras in the spine. I became paralyzed. Surgery again was done. Dr. Paul continued to treat my spine. I believe more damage to the spine was prevented because of his treatments. I needed nursing care that Cedar Lake Care Center provided for about one year. I was paralyzed, in a wheel chair, needed a catheter, and was very depressed at times. Dr. Paul came to the nursing home to treat me and encourage me during this time. I believe that God allowed me to be healed because of Dr. Paul and hope. Many friends prayed for a miracle for me, and I received it. I thank God and the work of Dr. Paul. I now live independently and comfortably again with no pain. I am living a fulfilled life and gained new neighbors and friends. My dog Toto and I found a home that allows us to stay together.